Drive to it, not through it. Wise words spoken by a long time local. Pass through town on the main road and you missed 90% of the experiences awaiting your discovery. Spanish and French Basques played an important role in Northern Nevada history as sheepherders and later as inn and restaurant owners. The Basque people made their way to the Silver State during the mining boom of the 1800’s. Shortly it was discovered they were better off providing meat and wool to the miners, plus Nevada’s open spaces were perfect for their sheep herds. They often stayed in boarding-houses and the group dining rooms of these ‘homes away from home’ marked the beginning of Basque family style dining. Basque dining in Gardnerville remains a culinary attraction. Don’t miss the culture of Basque dining and the staple cocktail of choice, a Picon Punch. Dangberg Home Ranch Historic Park was established in 1857 when German immigrant Heinrich Friedrich Dangberg started a new life in Nevada. He and his wife Margaret Ferris raised five children. Dangberg prospered, and his success as a rancher, businessman and politician established the Dangbergs as one of the most influential families in Carson Valley history. In 1906, the family founded the town of Minden, named after Minden, Germany which is near the birthplace of H.F. Dangberg. This historic stop won the Nevada Commission on Tourism award for Best Reno-Tahoe Territory Attraction. David Walley’s Hot Springs Resort & Spa, located in the town of Genoa Nevada, is surrounded with a 360˚ view of the majestic Sierra Mountain range. Although used for years by weary travellers on the Carson Route of the California Trail, it was formally founded in 1862 by David and Harriet Walley with only a tent for shelter and mineral baths selling for 50 cents. 1862 David Walley’s Hot Springs Resort & Spa now offers you a rare opportunity to indulge yourself in mineral rich hot springs that Mother Nature herself thrives in. For well over 150 years, these hot springs have gained world recognition for their healing powers. The Ferris Wheel, invented by George W. G. Ferris, Jr., younger brother of Margaret Ferris Dangberg, and unveiled at the 1893 Columbian Exposition aka Chicago World’s fair, was inspired by a water wheel at Cradlebaugh Bridge on the Carson River. During the time he lived in Carson Valley, young George Ferris spent hours watching the motion of the big water wheel, imaginably dreaming of riding around on one of its buckets. Perhaps from those early dreams came his inspiration for the Ferris Wheel. Nowadays you have the opportunity from April-July to take guided tours of the East Fork Carson River and explore the same waters G. Ferris himself once enjoyed. Fly sailplanes and gliders in one of the world’s most highly acclaimed locations – Carson Valley. The thermals created by the surrounding mountains and prevailing weather patterns create spectacular flight conditions. Pilots from throughout the international community come here to achieve their longest flights. 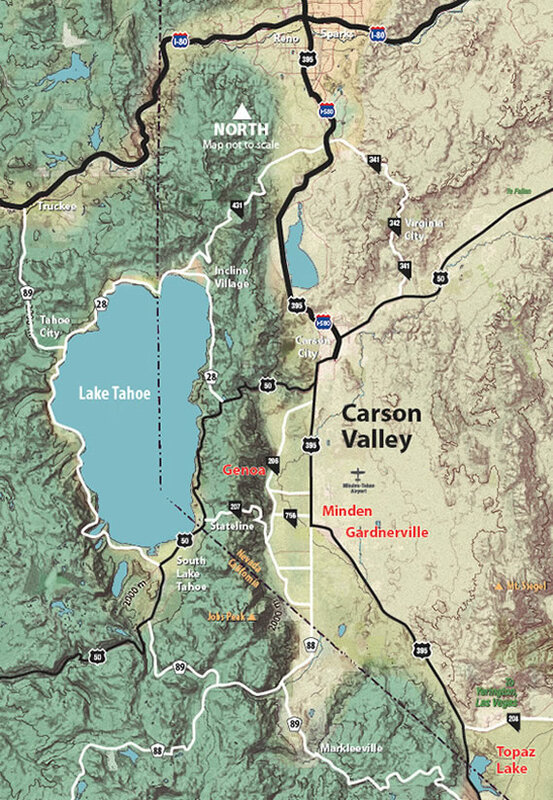 Whether you’re an experienced pilot bringing your own aircraft, a pilot wishing to improve your skills and rating or someone simply wanting to ride along and experience the thrill of soaring, Carson Valley is the place. Gardnerville’s cultural heritage lines Main Street Gardnerville. Shopping in Gardnerville is more than one of a kind discoveries; it can be a historical experience. Step back in time to another era and stroll down Main Street where friendly service is the Carson Valley way. Stop in and shop at the many quaint antique shops and boutiques, enjoy a glass or two of wine and a great meal at one of Gardnerville’s exceptional restaurants! Visitors learn even more about the local history and early culture of the area with a trip to the Douglas County Historical Societies Museum and Cultural Center located in the old Douglas County High School building. Genoa, considered the oldest permanent settlement in Nevada (established in 1851), is full of history and is also thought to be one of the most haunted. Join Genoa Historic Ghost Tours and learn about the town’s original Mormon settlers, the riders of the Pony Express, Nevada’s oldest thirst parlor and visit the Dake Hawkins House, considered one of the most haunted places in Northern Nevada. John ‘Snowshoe’ Thompson carried mail and supplies on skis for twenty winters between Genoa and Placerville (90 miles) taking two days to travel west and three days to return over the rugged Sierra. He now rests in the Genoa, Nevada cemetery next to his wife Agnes and son Arthur. His grave is marked with a pair of crossed skis. Today, the quaint town is a must for any traveler. Historic charm in the surrounding buildings, friendly accommodations, antique shops and boutiques, family friendly festivals and events, plus a replica of the town’s first structure at Mormon Station State Historic Park. FUN FACT #8: WHAT IS A CANDY DANCE? Every year, if you visit Genoa on the last full weekend in the month of September, you will see the small community filled with a multitude of visitors from all over visiting the many booths of handcrafted creations, Indian tacos, barbeque foods, attending the Saturday night dinner dance, and of course, buying and eating the delicious hand-made candy. It all started in 1919 when Lillian Virgin Finnegan suggested that the Town of Genoa raise money to install street lights. They held a dinner dance and served hand-made candy to those in attendance. Hence the name, Candy Dance. It was so successful that the Town of Genoa was able to buy not one but two lights and the event has been held every year (except for a few years during WWII) and it now helps to pay for town costs. Way to go, Lil! Hiking, biking, or horseback riding on the Carson Valley scenic trail system is the ultimate path to a day of challenge, discovery and sheer beauty. With over 50 miles of completed trails and current and proposed projects underway, there are a variety of trails for any experience level. More recent additions allow for longer outings with direct connections to the Tahoe Rim Trail and other lake experiences. The picturesque Pine Nut Mountains to the east of Gardnerville are equally rugged and offer exceptional opportunities to get out and explore. Families enjoy riding sagebrush lined trails on their OHV/ATV’s. You might occasionally come across horseback riders, hikers, or rock collectors—and possibly mountain bikers tackling the terrain. Minden’s downtown historic district hosts popular arts and crafts fairs and other community events throughout the year. Carson Valley Days in June is a true jump-back-in-time event in Minden and throughout the valley, complete with a parade and marching bands. Music concerts held in Minden Park on summer evenings offer listeners the perfect setting to enjoy live performances by popular musicians and bands while picnicking and connecting with family or new found friends. During the holiday season, the Christmas tree lighting at the park attracts all comers. The celebration of the country’s birthday every Fourth of July is another popular gathering closely linked to the community’s rich past. Be sure to explore the former railroad town and its rich agricultural and rural heritage with your Discover Minden Walking Tour Map. Topaz Lake Park offers 90 acres on the shores of Topaz Lake, a reservoir on the Nevada-California border only 20 miles south of Gardnerville and the northern gateway to the eastern entrance of Yosemite. If tubing, water skiing and pleasure boating is your thing, set off with a group of friends for Topaz Lake. 2-strokes are welcome. Skip the holdups and cost of extensive inspections. This location is ideal for anglers, hikers, water sports enthusiasts and is a well-kept secret among bird watchers. Aluminium motorized fishing boats for up to 4 people are available for rent from Topaz Landing boat rentals. Lake Topaz also offers lodging, camping and RV accommodations, a kids’ playground, as well as 24-hour dining, gaming and a full-service general store! The sunsets are unforgettable! Skiing and other snow sports activities are just a short 20 minutes away. Carson Valley serves as the ideal base camp to Heavenly, Kirkwood and more. Jump on easy routes and venture into 10+ mountain resorts from the valleys’ 4,700 foot base. Or, try this – slide and drive. This is one of the few destinations where you can enjoy a round of golf at one of the areas four year-round golf courses, then head up Kingsbury Grade for a 1/2 day of skiing.